An inviting fire has long been the focal point of gatherings with family and friends, whether it’s inside around the fireplace or outside by the fire pit. With that comes a host of safety requirements. Make sure you adhere to these do's and don’ts to ensure you’re lighting up responsibly. Have your fireplace professionally cleaned (swept). How often? At least once a year, according to the Chimney Safety Institute of America (CSIA). However, this will vary depending upon how often you light a fire. CSIA recommends that open masonry fireplaces be swept once they accumulate a 1/8-in of sooty build-up—enough fuel to cause a chimney fire. How about your fire pit? According to HGTV, if residue build-up becomes an issue, masonry fire pits may be cleaned using a solution of one part muriatic acid to nine parts water to scrub the interior. Once clean, rinse with water and allow it to dry for 48-72 hours before using. Dispose of ashes properly. Place ashes in a metal container away from your home or other structures. Shovel ashes out of your fire pit regularly. Make sure your smoke detector is functional. According to CSIA, detectors should be tested once a month to ensure they’re working properly. Keep your fire manageable. Whether inside or out, too large of a fire can lead to excessive smoke and wayward embers that could ignite rugs and furniture inside, or trees and dried brush outside. Have a container of water and/or working hose nearby when lighting an outdoor fire. Have the right tools on hand, including an ash scoop, a long poker, and tongs for repositioning logs. Store ashes inside the house or within five feet of your home or other structures outside. Burn the wrong kind of materials, such as trash, pressure-treated or green wood, which could release harmful toxins. Stick to dry, split wood and use leaves and sticks for kindling. Forget to check the forecast before lighting an outdoor fire. Avoid windy conditions that can blow embers. Extremely windy conditions can also create problems for your indoor fireplace, forcing air down the chimney and smoke into your home. Improperly position the logs in your fireplace. 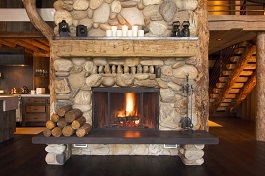 Logs should be placed toward the back of your fireplace and not be leaning toward the screen. This could cause smoke to filter into your home as opposed to up the chimney. Wait to call the fire department if you suspect a chimney fire. If you notice embers falling down the chimney into your fire and/or hear a loud, rushing sound, you could have a chimney fire. Call 911 immediately, and follow your emergency fire plan. For more home safety tips, contact me today.